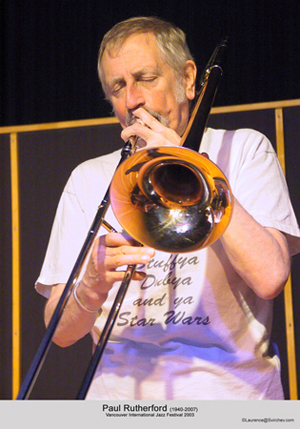 Paul Rutherford, the British improvising trombonist, died on August 6, 2007. He was kind and gentle, fond of sitting in a pub and sipping beer for long hours, discussing music, politics, human frailty, anything that affected the well-being of humanity, especially that of its artists. He held an abiding belief that the practice of improvisation made its practitioners and listeners challenge the existing orders of society. 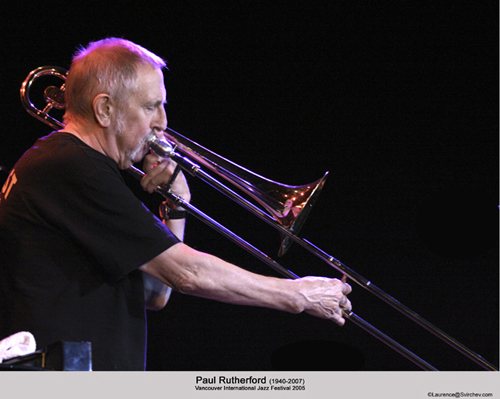 Rutherford was among the first generation of musicians to extend the jazz tradition into the realm of free improvisation. In the early 1970s, he formed and named the groups Iskra 1903 (with guitarist Derek Bailey and bassist Barry Guy, later with violinist Philipp Wachsmann replacing Bailey), Iskra 1904 (with saxophonist Evan Parker), and his improvising big band Iskra 1912. Iskra (“Spark”) was the name of a revolutionary anti-czarist newspaper published by Russian exiles between 1900 and 1905. The number 19 in the name referred to 20th-century new music, and the last two digits signified the number of musicians in each group. Paul Rutherford truly revolutionized the trombone as an instrument. He was known as a soloist in the real sense of the word, playing stand-alone trombone. The research is not definitive, but he may have been the first trombonist in the improvising field to create multiphonics by using his voice as well as other blowing devices. Rutherford also played in the Globe Unity Orchestra, the London Jazz Composer’s Orchestra and the Mike Westbrook Orchestra, in which he often soloed with the rest of the orchestra hushed. The photo at the top of the Misterioso site shows Rutherford with the Globe Unity Orchestra at its 40 Anniversary in Berlin. He also performed with the Dedication Orchestra, and in a trio with Anthony Braxton and Evan Parker. In 2005, he toured and recorded with tenor saxophonist Ken Vandermark, drummer Dylan van der Schyff, and bassist Torsten Müller in a group called Hoxha.